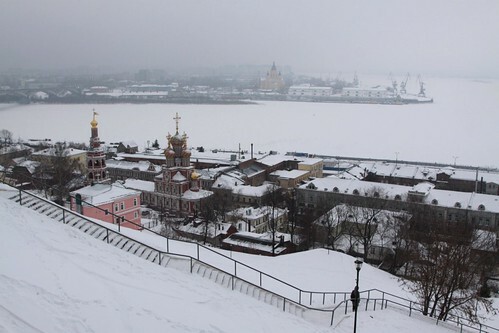 One of the places I spent some time in on my journey across Russia was Nizhny Novgorod – the fifth largest city in the country, located a few hours west of Moscow at the confluence of the Volga and Oka Rivers. So what is there to see from an urban rail perspective? 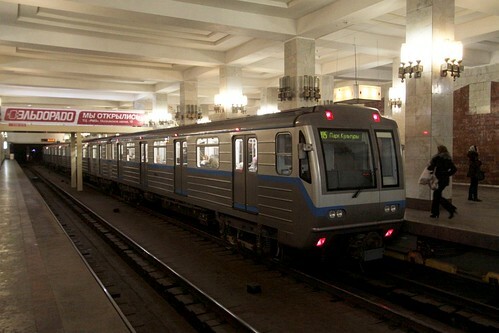 Unlike the ‘standard’ Soviet-era metro system design of three lines intersecting under the city centre to form a triangle, the geography of Nizhny Novgorod resulted in the metro only serving the western bank of the Oka River, until it was extended across the Oka River to the city centre in 2012. 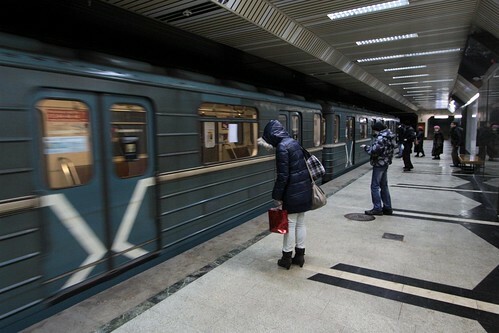 The trains are the same blue-liveried ‘Type 81-717/714’ as seen all over the former Soviet Bloc. 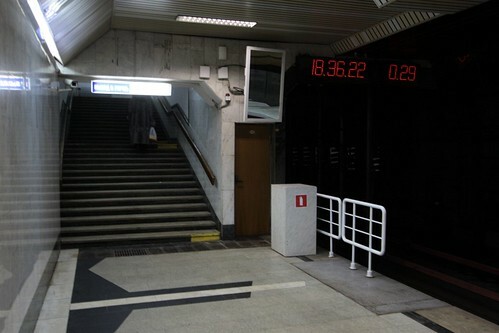 Another typical Soviet Block metro feature is the clock at the end of each platform – they count upwards from the departure of each train, allowing drivers to maintain a consistent service headway. 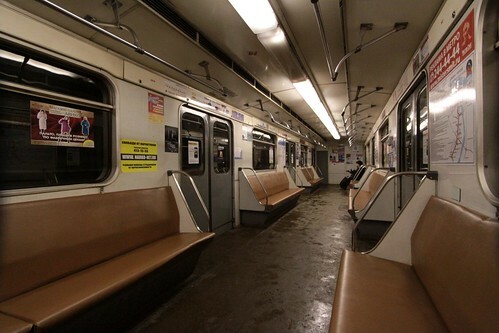 Inside the trains the interiors look very dated. The exception being advertisements for the latest consumer goods. 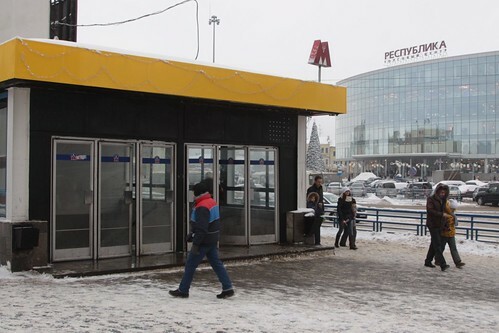 As for the design of the metro, the street entrances blend into the bland city streets. 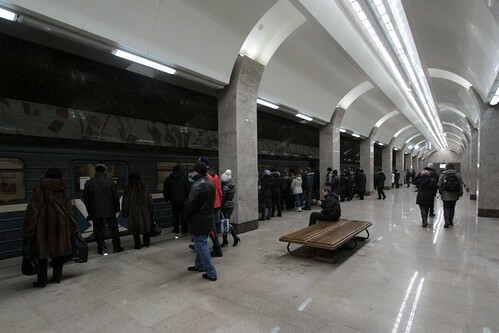 The newest station on the network is Горьковская (Gorkovskaya) – opened in 2012 as the terminus of the eastwards extension over the Oka River. All bar one of the stations are underground, but all are located close to the surface. 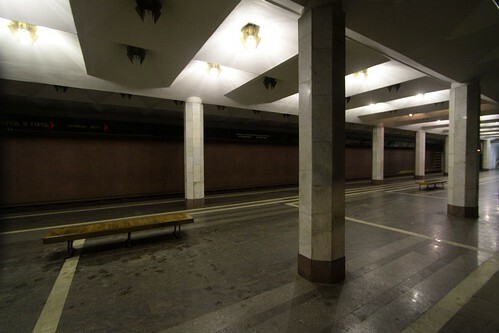 The ‘pillar-trispan’ style is the most common design, where two rows of columns run down the middle of an island platform. A handful of ‘vault’ style stations also exist, leaving a clear area for waiting passengers. 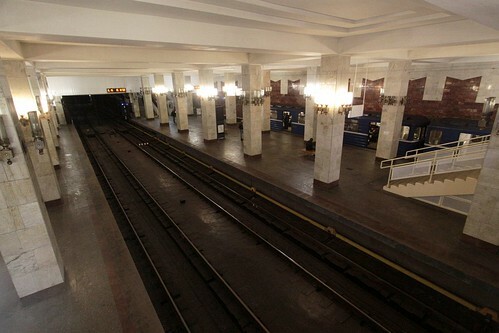 Буревестник (Burevestnik) station is a little different, as the platforms flank the tracks with a row of columns running between the tracks. 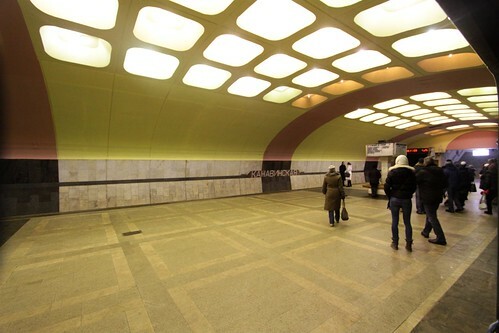 However the design of Московская (Moskovskaya) is unique among Soviet Bloc metro stations. The ornate chandeliers might be a common sight in Moscow and Saint Petersburg. 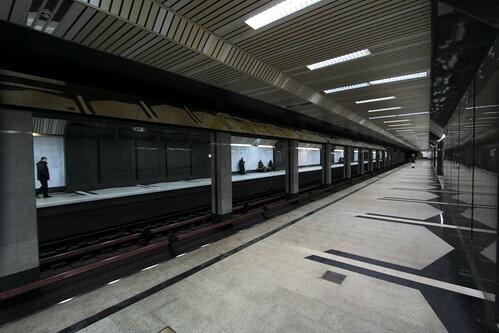 But with two island platforms located a single cavern, it is the only example of an ‘all in one’ interchange station – the usual design has a island platform for each line, linked by long pedestrian walkways. The footbridge in the middle of the platforms also allows for passengers to change direction. 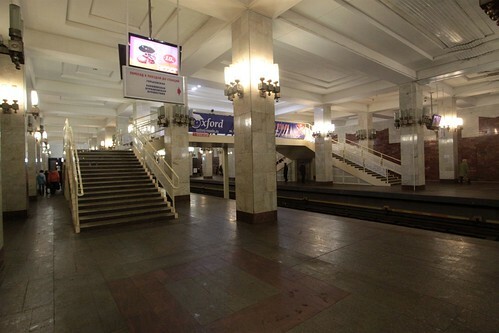 When I visited Nizhny Novgorod in late-2012, Gorkovskaya station was so new that anything in the English-language didn’t know about it – Google Maps drew a complete blank, and Wikipedia haven’t been updated to mention it! 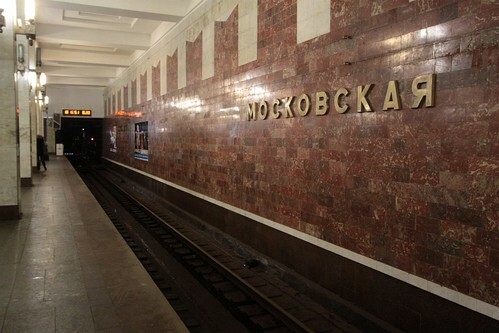 I spent thirty fruitless minutes wandering around the city trying to find the station entrance, before I turned to a very method of tracking it down – digging up the English Wikipedia article for the neighbouring station, following the link to the Russian article, and then following the links from there until I found the latitude and longitude reference of the station. 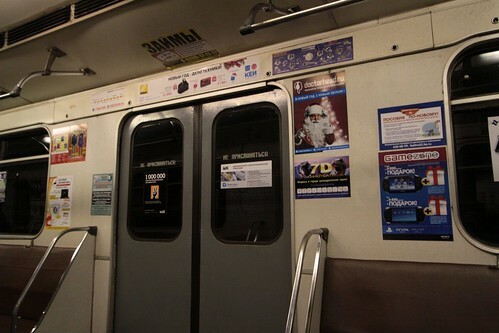 This entry was posted in Trains and tagged metros, Nizhny Novgorod, Russia, underground. Bookmark the permalink.